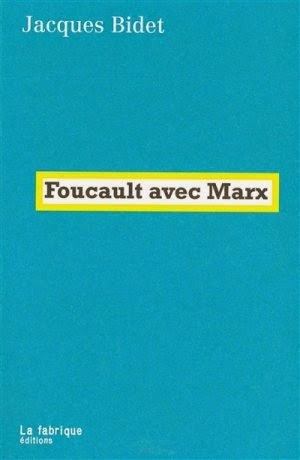 For reasons that are as much historical as they are philosophical the relation between the thought of Foucault and Marx has become a topic of inquiry again. There are multiple versions of this question, from Macherey's investigations into the concept of "norms" as a central aspect of capitalist society and social relations, to questions about Foucault's interest in neoliberalism. A question that was generally considered decided in past generations has been reopened in multiple ways, running the gambit from the speculative to political. Jacques Bidet's Foucault avec Marx adds what could be considered a structural dimension to this question. Bidet's interest in the relation between Foucault and Marx is not framed at the level of the former's opinions, citations, or readings of Marx. The famous line about fish in the water is not even cited. Nor is it augmented by citations to some of the Foucault's lesser known writings that have come to light in recent years. Rather, Foucault and Marx are juxtaposed at the level of how they posit the structure of capitalist society, or what they contribute to such an idea. Bidet's reading of Marx was in part developed in his work on Capital, and a general Marxist theory. Bidet argues that Marx posits a dialectical relationship between "structure" and "meta-structure." The first, structure, is class division, class relation. The emphasis is less on class as a group than the structuring division which determines different relations, to the means of production, knowledge, etc. As Bidet writes, "The class relation, such as it is construed in Capital, describes not a group, but a division in the social body." The meta-structure refers to the relations between individuals, relations which are primarily competitive. As Bidet writes, "One always refers to the interindividual relationship of each to each and between all, but it is the class relation that returns us to it. It is the class relation that generates the universality of the market relation, as Marx explains. More precisely, the structure of class defines the contradictory field of different economic practices (which are also social and political) possible at the heart of modern society." (Earlier and elsewhere I addressed these two aspects of Marx's analysis not as a dialectic of structure and metastructure, but as two different individuations). Bidet's focus on the dialectic of metastructure and structure is to demonstrate the manner in which capitalist social relations function in and through the intersection of structure and metastructure. The metastructure of competition effaces the structure of class division while being entirely determined by it. This relation of structure and metastructure is not without its corollaries in Foucault. Bidet, like Macherey and Grant, reads Foucault as positing a distinction between the legal order of society, the metastructure of liberties, and the power relations of society, the disciplines. As Foucault writes, “The 'Enlightenment', which discovered the liberties, also invented the disciplines.” Bidet reads this, along with other such statements, like the statement in the History of Sexuality that "power is tolerable only on condition that it masks a substantial part of itself" to be not only a theory of ideology in Foucault, but one roughly analogous to Marx's division between the sphere of exchange, defined by "Freedom, equality, and Bentham," and the "hidden abode of production." In each case formal equality is both contradicted and maintained by the asymmetry of powers. Bentham changes place, but the basic structure stays the same. Bidet thus adds to the chorus who would argue that despite all appearances to the contrary Foucault has a theory of ideology, even if that there is expressed through images of kings with their heads attached rather than concepts. Bidet suggest that Foucault puts to light a different aspect of the class structure, of the class relation. Whereas Marx focused on the ownership of the means of production as the central aspect of class relation, Bidet argues that Foucault offers a different axis--one focusing on control over knowledge. Power-knowledge is a different aspect of the class relation, one that comes into increasingly prominence in the twentieth century as "money-bags," the owners of the means of production, are increasingly mediated by an entire managerial class of engineers. Knowledge and expertise become as important as property relations. While it might be interesting to think of Foucault's entire project as being an oblique contribution to what used to be called the division of mental and manual labor, it is difficult to sustain such a connection. As Bidet argues the closer that Foucault comes to the twentieth century in the lectures of the late seventies, the further he departs from the Marxist division of structure and metastructure. Governmentality, and the idea of a particular neoliberal governmentality, is predicated on the destruction of a division between liberties and disciplines--that is one way to understand neoliberalism. Of course the question remains if Foucault's departure from any division between politics and economics, base and superstructure, is a theoretical or historical departure, a rupture of perspective or a change in social relations.